Is a Disneyland VIP Tour right for you? Mousetalgia reports from a full day of VIP touring around the resort and offers tips and advice regarding VIP tours, some of which may surprise you. The VIP Hosts and Hostesses (in the famous Disneyland plaid outfits) act as living fastpasses, and we discuss the pros and cons of having nearly instant access to so many E-Ticket attractions. Can there be too much of a good thing? Also – we report on a new lunch menu at Club 33, with seasonal desserts that are to die for, and we discuss the pros and cons of reserved seating for Main Street shows. Kristen also reports briefly on the resort-specific games and offerings for hotel guests. Plus – Tony Baxter’s Main Street Window is installed above the Magic Shop, our first listener review of Frozen, and a report on a limited-time magic opportunity to meet and greet Thor at Disneyland. 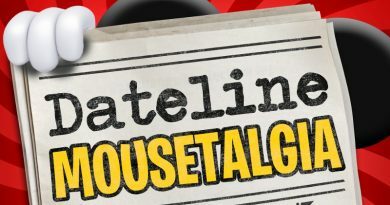 Dateline Mousetalgia – Episode 30 – It’s Raining Cats and Dogs!